Almo Nature - Dog - HFC 95 Natural is a delicious meal for your dog. This wet food is made of 100% HFC ingredients, such as fresh meat, fresh fish and rice. The ingredients in this food were originally meant for human consumption. You dog will certainly enjoy this food thanks to the high content of fresh meat and fish. 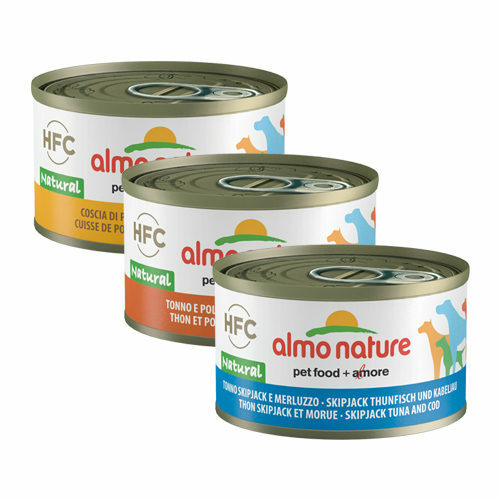 Almo Nature - Dog - HFC 95 Natural is tasty wet food for your beloved pet. This dog food has been prepared with 100% HFC ingredients, such as fresh meat and rice. These ingredients were originally meant for human consumption. So you can be sure your dog is getting the best! In addition, this dog food does not contain any conservatives and colourants. The delicious meat or fish will ensure your dog can truly enjoy this meal. Chicken leg meat: chicken leg meat 55%, chicken stock 42%, rice 3%. Tuna and Chicken: cooking liquid, tuna 29%, chicken 26%, rice 3%. Skipjack Tuna with Cod: cooking liquid, skipjack tuna 27.5%, cod 27.5%, rice 3%. Have you used Almo Nature - Dog - HFC 95 Natural before? Let us know what you think about this product.